On Election Day, Some Glitches Reported Some problems with voting machines and other issues have come up as voters turn out for the presidential election. Some problems with voting machines and other issues have come up as voters turn out for the presidential election. There are reports that some voters have experienced problems today casting their ballots, although voting in most places appears to be going smoothly. NPR's Pam Fessler is tracking this issue for us. And Pam, what kinds of problems are you hearing about? PAM FESSLER: Well, I'd say the biggest thing that we've seen today are lines, lines, and more lines, which could be good and bad. There have been scattered problems around, but nothing I would call a major disruption. There's this coalition of voting rights groups called Election Protection. They're getting calls from voters. They've received more than 32,000 calls so far. And a lot of them have been complaining about the long lines. And one of their biggest concerns has been in the state of Virginia. And one area, especially down in Chesapeake, Virginia, near Norfolk, lines have been six and seven hours long. And part of it is because machines have broken down and the system is just overloaded. We've also heard long lines in Michigan, in Pennsylvania. At Penn State this morning, there were a thousand students waiting to vote. And then we got reports - NPR's Larry Abramson is in the St. Louis area. And he said out in the suburbs at midday today, there were waits of up to five hours. And he said in some places there weren't enough judges to accept voters coming in and check their registrations and that there were also some voters who were reluctant to use the touch-screen voting machines because they'd heard about votes flipping. So they were waiting for paper ballots so they could use an optical scan machine. But he said then in some precincts they ran out of the pens that voters needed to mark those ballots. BLOCK: Physically ran out of the pens themselves. FESSLER: Yeah, they were running low on them. BLOCK: Pam, you mentioned machines breaking down. What kinds of mechanical problems have you been hearing about today? FESSLER: Well, I - it's kind of interesting because we always hear so much about the touch-screen voting machines, but a lot of the reports that we've heard today have been with the optical scan machines which some jurisdictions, say in the state of Florida, have used to replace the touch-screen voting machines. These optical scan machines, basically the voter fills out a paper ballot. It is run into the machine. The machine counts it, pops it out if it's a problem. But what we've found is some of the - we've heard reports that some of the optical scan machines in some precincts have been jamming. They're paper jams or getting overloaded. And there have also been reports in areas such as Virginia and North Carolina about problems with wet ballots. 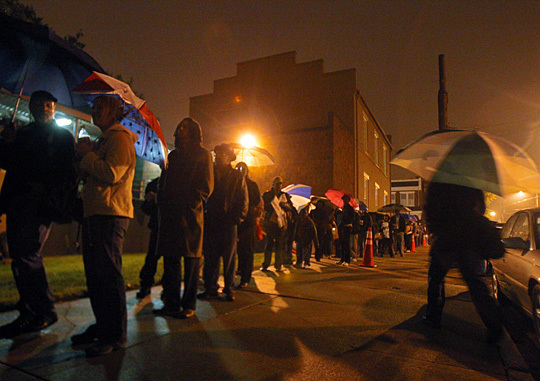 Voters have been standing out in the line, out in the rain. And when they come in, their clothes are wet. They're given their paper ballots, and the ballots are getting wet, and then they get jammed in the machines because they're too soggy. So they have to set them aside, wait for them to dry, and they'll count them later. FESSLER: We've also heard a few - you know, we continue to have these problems with hearing voters receiving deceptive phone calls and misleading information and signs that they're told that their polling place is somewhere else, that they might get arrested if they have an outstanding warrant. This morning, one of our callers told us that at George Mason University, an email went out to the entire student - to the entire university community telling them that Election Day was tomorrow. And it was signed by the provost of the university. He of course later had to send out an email saying no, no, that didn't come from me. Somebody hacked into my system. Voting is today. BLOCK: Well, this is a huge range of problems that you're describing. What are some of the remedies to try to fix? What's going on today? FESSLER: Well, for the most part, we really actually haven't seen a lot of litigation yet. We expect a lot - now, that could come later in the day. But mostly the voter rights groups and the campaigns have been working with election officials, trying to see if they can help rectify these problems while voters are there. For example, in the Chesapeake, Virginia, case, the local registrar has sent down extra workers there, and it looks like those lines are being cut in half. There was some talk about maybe going to court to extend voting hours in Virginia, but that looks like it's not going to happen now. And there's a lot of reluctance to do that because if they do, then voters who cast ballots after they've extended the hours have to cast a provisional ballot. And as you know, those are counted later on. BLOCK: But if you're standing in line by the time the polls close, you should be allowed to vote no matter how long it takes you to get through that line? FESSLER: Exactly. If you're in line at 7 o'clock and the polls close at seven, even if you don't vote till midnight, you'll get to vote. And they're trying to get that message out. BLOCK: Very briefly, Pam, we saw huge problems obviously in 2000, and things were supposed to be better. What's happened? FESSLER: Well, I think what it is partly, we have such a huge crowd today that the system is being tested like it's never been tested before. We also have much more scrutiny. Every single thing that happens in voting places is watched by someone, so every teeny little problem gets noticed. BLOCK: OK, NPR's Pam Fessler, thanks very much. FESSLER: Glad to be here. Voters line up before 6 a.m. at a polling place in Richmond, Va.
Long lines of voters snaked around polling places across the country on Tuesday. People in many states waited for hours — sometimes because of voting problems and in other cases, simply because of enormous turnout. Despite the long lines, most voting went smoothly. 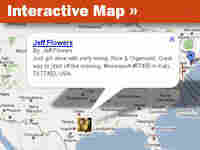 There were, however, some glitches in important battleground states. Below, a breakdown of some of the key places voters experienced challenges on Election Day. An early-morning rush and bad weather in some parts of the state combined to create a messy start to the day in Virginia. One Richmond polling place opened late when a poll worker overslept. By the time voting began at the site, hundreds of people were in line. In other parts of the state, rain drenched people while they waited to vote. Wet paper ballots then jammed voting machines, causing further delays. In Chesapeake, Virginia, crowds of voters arrived at polling places after work, pushing lines even farther around the block into the darkness. Voter David Lee Spellman of Chesapeake wrote in a sworn affidavit collected by Election Protection that he had waited more than five hours to vote. "This is unacceptable," he wrote, "especially since the governor was forewarned about the possible lack of preparation. 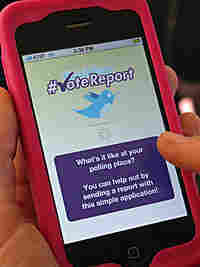 It was public knowledge that voter registration was at a record high and that the anticipated voter turnout was great." State election officials said some voters received automated phone calls sending people to the wrong polling place. Officials warned voters not to believe such calls. At George Mason University, someone hacked into the school's computer system and sent students and teachers an e-mail claiming to be from the school provost. The e-mail said the election had been moved to Nov. 5. The real provost, Peter Stearns, later followed up saying, "The notion that one party votes Nov. 5 is untrue." Eight years ago, voting problems in Florida infamously extended the presidential election for weeks. Ultimately, the Supreme Court had to intervene. This time around, election supervisors in the state said there were plenty of glitches but nothing on the scale of 2000. Palm Beach County Administrator Bob Weisman told the Palm Beach Post that voting problems are "minor in nature, but there are a lot of them." John Greenbaum of Election Protection described "massive breakdowns" with electronic voting machines. He said poll workers responded to those breakdowns appropriately by issuing paper ballots and placing the completed ballots in lockboxes, but when those boxes filled up, poll workers started storing ballots in duffel bags or in piles on the floor. Greenbaum said that is not acceptable. "They need to come up with a method to make sure people's ballots are safe," he told reporters. At least two polling places in Florida opened late. At one, a lock had been changed. At the other, a precinct clerk spent an hour filling out paperwork before opening the doors at 8 a.m. State law requires all polling places to open by 7 a.m.
At some voting places, poll workers had to crosscheck election-day voters' names with lists of people who had voted early. However, the lists of early voters were not alphabetized. As a result, some Florida voters waited in long lines while poll workers scanned the names on huge lists to make sure people weren't voting twice. On Monday, Pennsylvania Gov. Ed Rendell and Philadelphia Mayor Michael Nutter urged people not to vote before or after work because they feared the crowds could be overwhelming. Indeed, by the time polling places opened at 7 a.m. on Tuesday, more than 100 people were already waiting in line at some voting sites. Rendell urged people to "hang in there." Philadelphia Elections Supervisor Bill Rubin told CNN that voting machines failed in 8 out of the city's 1,681 election divisions. He said voters at those sites were allowed to use emergency paper ballots. There were also reports of misleading fliers being distributed to voters in Pennsylvania that said Democrats should vote on Wednesday and Republicans on Tuesday. Rebecca Halton, spokeswoman for the Pennsylvania Department of State, told the Philadelphia Inquirer that problems so far were minor. "Nothing that hasn't been mitigated quickly and successfully," she said, "and at this point, nothing that's uncommon." Ohio decided the presidential race four years ago. This year, thousands of new voters have caused some problems. NPR's Andrea Seabrook reports that first-time voters are causing a snag known as the "double bubble." This is when a voter marks the circle next to a candidate's name and also writes the candidate's name in the section that says, "Write in Candidates." Some machines recognize this problem and allow election officials to manually determine voter intent. But in other instances, the voting machine negates the vote without notifying election officials. Ohio Secretary of State Jennifer Brunner has instructed election officials to count "double bubble" ballots by hand after unofficial results are announced Tuesday night. In one Ohio polling place, a touch-screen voting machine would only cast ballots for independent presidential candidate Ralph Nader. According to the Columbus Dispatch, a poll worker told voters, "You can use it if you want to vote for him." In Kansas City, Mo., a polling place opened with the wrong list of registered voters. As the line of people waiting to vote grew, some people left, saying they would come back to vote later. Voters around the state reported that polling places were overextended. 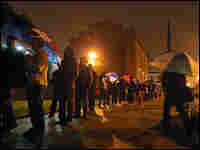 NPR Correspondent Larry Abramson observed waits of more than 5 hours at one St. Louis polling site. St. Louis voter Jamie Rodriguez told NPR via Twitter, "Poll workers short staffed, coming outside and asking random people if anyone can help!" When Missouri's chief elections official voted early on Monday, she was asked for identification. Missouri Secretary of State Robin Carnahan told reporters she's afraid that poll workers in the state may try to demand identification from voters even though Missouri does not have a voter ID law.